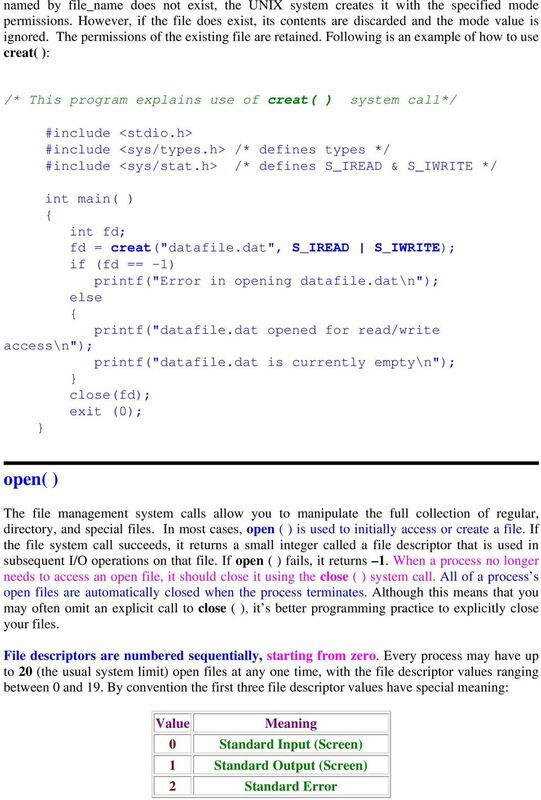 Download "System Calls Related to File Manipulation"
4 where file_name is a pointer to the character string that names the file, option_flags represent the type of channel, and mode defines the file's access permissions if the file is being created. Multiple values are combined using the operator (i.e. bitwise OR). Note: some combinations are mutually exclusive such as: O_RDONLY O_WRONLY and will cause open( ) to fail. If the O_CREAT flag is used, then a mode argument is required. The mode argument may be specified in the same manner as in the creat( ) system call. 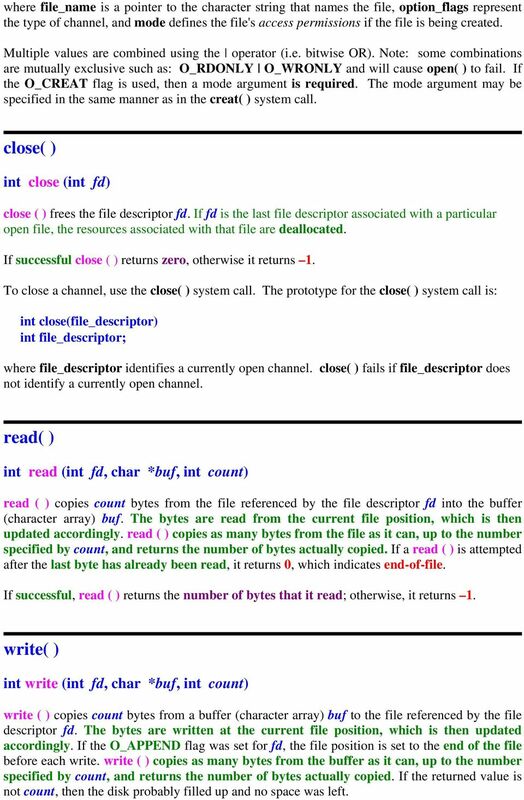 close( ) int close (int fd) close ( ) frees the file descriptor fd. 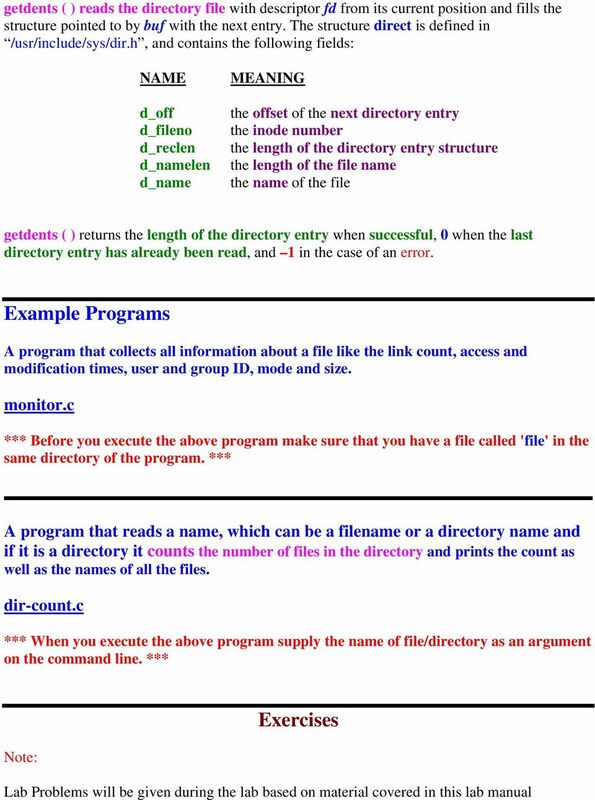 If fd is the last file descriptor associated with a particular open file, the resources associated with that file are deallocated. If successful close ( ) returns zero, otherwise it returns 1. 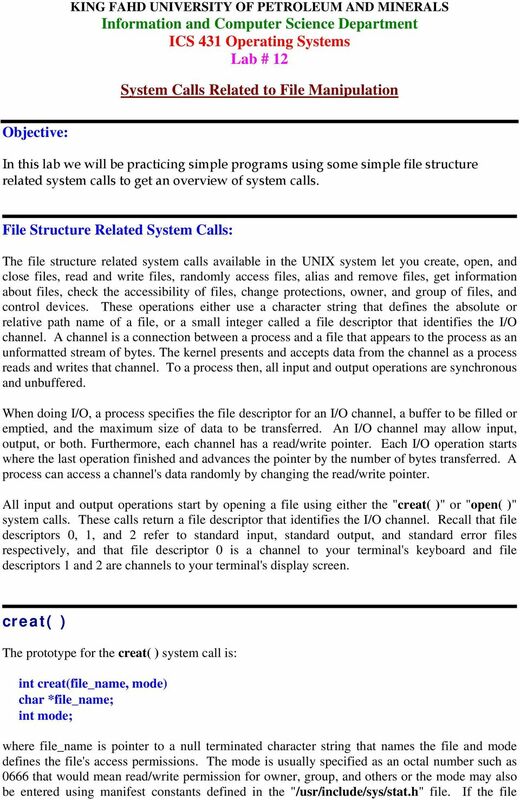 To close a channel, use the close( ) system call. The prototype for the close( ) system call is: int close(file_descriptor) int file_descriptor; where file_descriptor identifies a currently open channel. close( ) fails if file_descriptor does not identify a currently open channel. 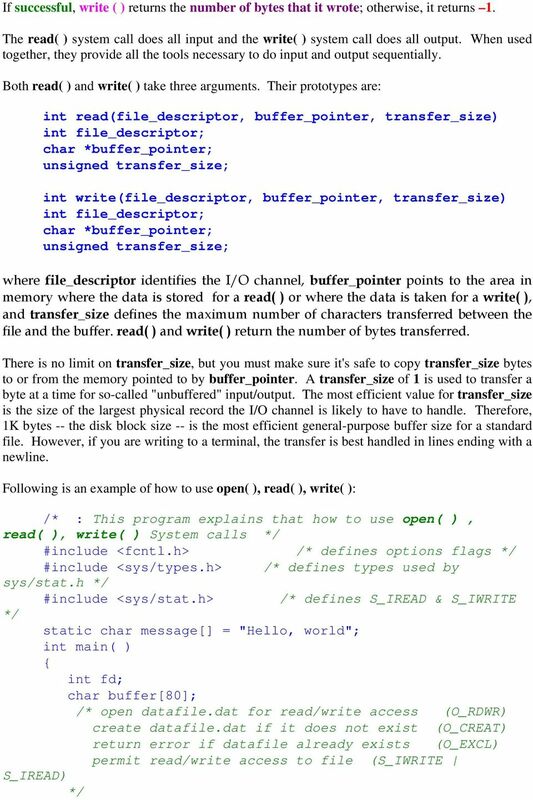 read( ) int read (int fd, char *buf, int count) read ( ) copies count bytes from the file referenced by the file descriptor fd into the buffer (character array) buf. The bytes are read from the current file position, which is then updated accordingly. read ( ) copies as many bytes from the file as it can, up to the number specified by count, and returns the number of bytes actually copied. If a read ( ) is attempted after the last byte has already been read, it returns 0, which indicates end-of-file. 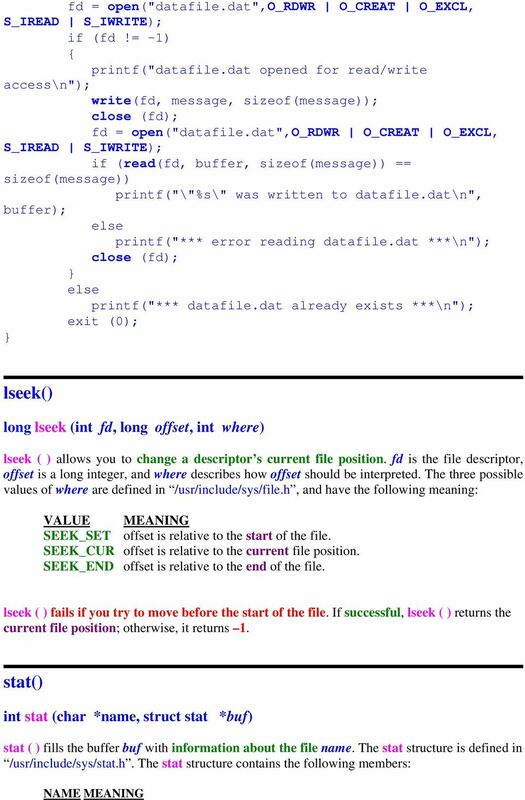 If successful, read ( ) returns the number of bytes that it read; otherwise, it returns 1. write( ) int write (int fd, char *buf, int count) write ( ) copies count bytes from a buffer (character array) buf to the file referenced by the file descriptor fd. The bytes are written at the current file position, which is then updated accordingly. If the O_APPEND flag was set for fd, the file position is set to the end of the file before each write. write ( ) copies as many bytes from the buffer as it can, up to the number specified by count, and returns the number of bytes actually copied. If the returned value is not count, then the disk probably filled up and no space was left. Chapter 18 I/O in C. Copyright The McGraw-Hill Companies, Inc. Permission required for reproduction or display. Herbert Martin Dietze University of Buckingham herbert@the-little-red-haired-girl.org July 24, 2001 Abstract The course introduces the C programming language and fundamental software development techniques. CPSC 410/611: File Management. What is a File? 1 Posix API vs Windows API 1.1 File I/O Using the Posix API, to open a file, you use open(filename, flags, more optional flags). 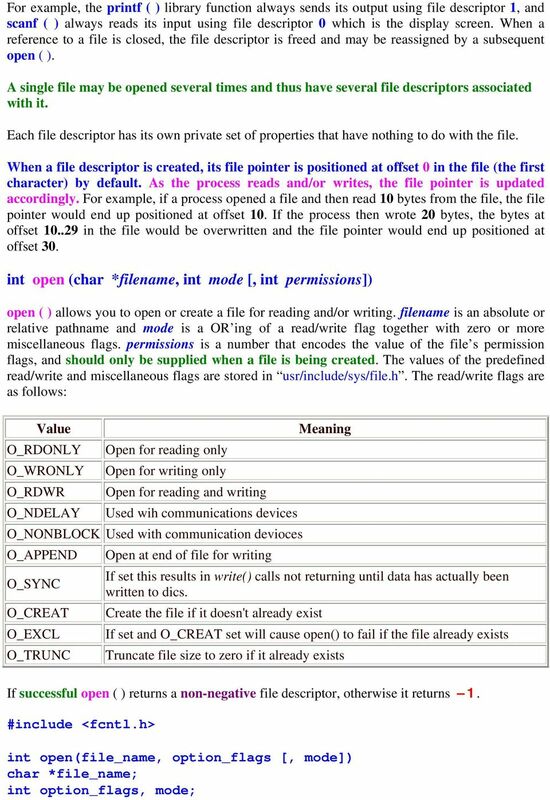 If the O CREAT flag is passed, the file will be created if it doesnt exist. 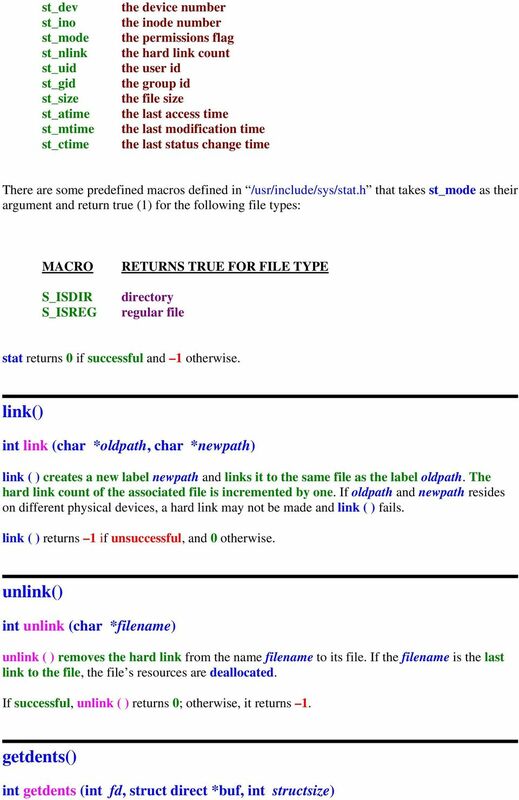 They are the standard IO channels: std_in is usually connected to the keyboard, and printing onto std_out and std_err usually appears on the screen. As previously noted, a byte can contain a numeric value in the range 0-255. Computers don't understand Latin, Cyrillic, Hindi, Arabic character sets! IPC. Semaphores were chosen for synchronisation (out of several options). SANKALCHAND PATEL COLLEGE OF ENGINEERING, VISNAGAR ODD/EVEN ACADEMICSEMESTER (2014-15) ASSIGNMENT / QUESTION BANK (2110003) [F.Y.B.E. The char Data Type. Character and String Processing. Another Example /* Capitalize all lowercase letters */ while ((c = getchar())!